Her mettle was repeatedly tested and hardened in the intense heat of the political crucible above Toronto. In her first full year in Vaughan’s top job, she faced legal battles and council skirmishes — even a wounded knee and reparative surgery — yet she refused to back down, preferring instead to stand and fight. Because of the tenacious will to survive she displayed throughout 2007 and the long shadow she cast over the GTA’s media, Mayor Linda Jackson is Vaughan Today’s first Newsmaker of the Year. The title isn’t an endorsement of the winner but rather a recognition of the person’s affect on Vaughan — for good or ill.
For Jackson, 2007 began under a cloud of controversy. The veteran of Vaughan council had only recently been elected mayor by a razor-thin margin of just 90 votes, ending Michael Di Biase’s tenure and returning a Jackson to the office once occupied by her mother, Lorna. When voting in the Nov. 13, 2006 municipal election was over and the two leading contenders discovered their electoral fates, Di Biase told disappointed supporters that he would pursue a recount. Two weeks later, the results of a city council-ordered recount confirmed Jackson as the winner. Not satisfied, Di Biase went to Ontario Superior Court where, in April, another recount was ordered. For the third time in five months, Jackson was declared mayor of Vaughan. Di Biase finally relented. Also stemming from the controversial municipal election and remaining in the news well into 2007 was the story of stolen emails. All the seedy characteristics of a mass-market crime novel were present: a mayoral candidate in secret contact with a York police officer, the apparent criminal theft of those communications from her city hall computer, and the mysterious Thanksgiving-weekend delivery of the emails to her political rival’s doorstep ahead of the 2006 election. Jackson’s enemies alleged the emails proved inappropriate conduct motivated by political interests. And though investigations by the Waterloo Regional Police and the Ontario Civilian Commission on Police Services led to disciplinary action against the York officer, Jackson was cleared of any wrongdoing. But the nightmare of the 2006 election does not end there for the embattled mayor. In May, Quintino Mastroguiseppe and Gino Ruffolo accused Jackson of running afoul of the Municipal Elections Act more than 20 times, and asked council to audit her campaign’s finances. That same act allows a candidate to extend their final financial statement filing date. Jackson took advantage of this legal tool because of the campaign costs she continued to incur during the Di Biase recount battle. With Feb. 29, 2008 the final deadline for Jackson to file any supplementary financial statements, council decided to put off making a decision on the audit. As a consequence, Jackson found herself in court once again after Mastroguiseppe and Ruffolo took their audit request to the Newmarket court. “These allegations are completely unfounded and are entirely without truth,” Jackson said at the time. This latest judicial battle won’t be settled until Ontario Justice Lucia Favret decides on Jan. 22 whether to order the compliance audit. Even as echoes of the contentious election war continued to reverberate in the halls of power, Jackson managed to focus on the city’s business in 2007, though the council chamber was not necessarily a sanctuary from her troubles. Clashes with councillors and senior city staff were familiar, if not common. Just in the past few months, Jackson has been criticized on several occasions by her council colleagues for being secretive with her date book — a Nov. 29 promotional trip to Edmonton was a surprise to several councillors and prompted some to call for an explanatory report. In spite of all the controversy that seemed to hang around her, Jackson’s 2007 had several decidedly uncontroversial high points. Though it may have been others, including her predecessor, that did most of the heavy lifting, she was mayor when the subway extension to the Vaughan City Centre was announced in March. The same is true of the province’s April declaration of support for a hospital in medically underserved Vaughan. 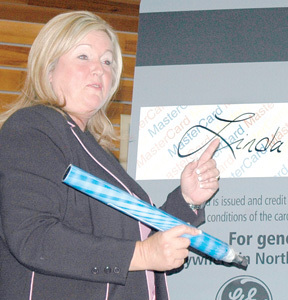 On Sept. 17, a beaming Jackson stood next to a massive novelty credit card bearing both her name and the city’s logo. The MuniCard, the first co-branded credit card of its kind in Canada, rewards spenders with credit toward their Vaughan property tax bills. A couple of months before that, the Toronto Star praised Jackson for proving her credentials as a “green-first politician” after the opening of Apple Blossom Park in Thornhill. Just how green she is, though, is limited — she is the self-described “grow-op queen of the GTA”, after all, and Vaughan Today’s inaugural Newsmaker of the Year.